Months ago now, we had a request to host an agricultural student for a 12 week internship. The student studied in Toulouse but was from Bordeaux, France. 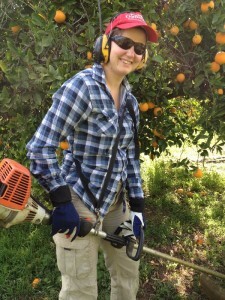 She wanted to work on an organic fruit tree farm somewhere in Australia. Fat Goose Fruits fitted the bill. We corresponded and agreed on dates, work duties, housing arrangements and so forth and generally got to know a little about each other. Photographs were swapped and then we waited for our visitor, Amandine, to arrive. Unexpectedly and with disappointment we shared via email that Amandine had broken her ankle (stand up paddle boarding a couple of days after exams!) and couldn’t travel. Her trip was to be delayed some 6 or 7 weeks. We recognised each other immediately at the airport, collected luggage with smatterings of both English and French and then we proceeded to whisk her around Adelaide on our usual whirlwind city visit – jobs to be done, you know. Replacement part for the fridge, furniture to collect, fruit to drop off, Colonel Light’s lookout over city for her to gain her bearings, son to kiss, grandmother to hug…a late afternoon catch up with a kind friend over Coffin Bay oysters, some good Ozzie sparkling and a viewing of her very fine paintings, before finally, dinner and bedtime in Strathalbyn with others in the Fat Goose Fruits crew! Phew, exhausted right? Amandine seemed to enjoy all of this. Can you imagine? Forty or so hours of travelling…Bordeaux, Paris, Dubai, Sydney, Adelaide, Strathalbyn (all the waiting, waiting…) and not yet home to Renmark? The time has flown, with Amandine being a great compliment to our team, not to mention the delicious French recipes. She has tucked in to work tasks required of her; irrigation management, whipper snipping, hoeing, goose herding, pruning, packing fruit, insect monitoring, veggie gardening, etc. etc. She’s asked questions and introduced us to new ideas in return. Her report will focus on the pros and cons of animal grazing in tree crops. The 5 year masters degree sounds very balanced and interesting. Her fourth year of study requires that she study for 6 months in a foreign university. Her penchant at the moment is for Sweden. Here at home on the ‘block’, we can only imagine!